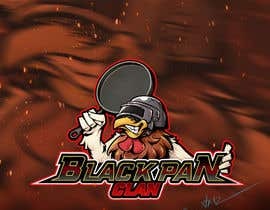 Hello I am looking for a amazing logo created for my Team the "Black Pan Clan". I would like a Rooster Face showing a GRIN and wearing a Level 3 Helmet fully finished. I would like the Rooster to be holding a Pan of Judgement cooking Pan like hes about to swing it. 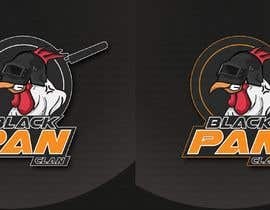 The bottom of logo will show the team name: BLACK PAN CLAN. The colors I would like are Orange, Black and White. Please make the Rooster colorful with orange, white, reds and yellows. Please make sure the Helmet matches examples closely. Please make sure the rooster resembles the attracted example bird. I have included a example Team Logo that i really liked.